A perfectly good bird cut down by the magic of sand and a small cavity for brain matter. Actually, I’ve seen humans walk into glass doors as well, so not sure how much the brain size plays into this particular situation. By a general rule of thumb, the survival rate is directly proportional to the volume of the impact. Through extensive trial and error, I’ve been able to improve this rate at least a little bit. The success is dependent on how quick you can come to the aid of the injured bird. Upon impact, the bird often loses consciousness and drops backwards onto the porch – the reasoning behind this still needs further research. If the bird doesn’t snap it’s neck, it will show signs of convulsions both with fluttering wings and spastic feet. This is exactly the state I found the bird pictured above (note I had the camera in my hand already taking pictures of some other subjects). 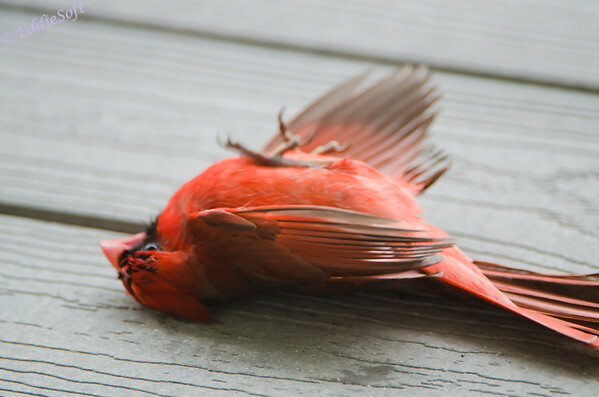 If you can get to the bird in this state, you must immediately flip it back over on its feet/belly. If you leave it upside down, it will die every time (my apologies to all the failed experiments before this was figured out). Kind of reminds me of my mode of operation with my drunk friends in college, but let’s stay on topic. Hit the jump for some good news! Once righted, this is what he looked like. If you look close at the eyes, you will see them continually blinking. Obviously, this is the same attempt we make to clear the fog from concussions. I generally back away to help keep the stress down as much as possible but I do watch the head very closely. If it starts to fall towards the ground I usually make some motion by it, which startles it enough to raise the head back up. 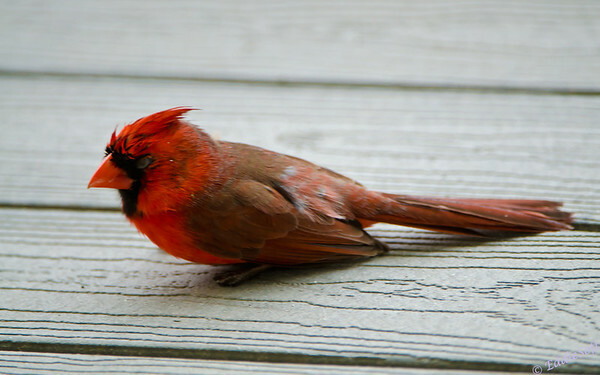 In this particular case, the cardinal dosed off three times but perked up every time after I waved my hand near it. Through the course of all this, the blink rate started to subside which was a very good sign. 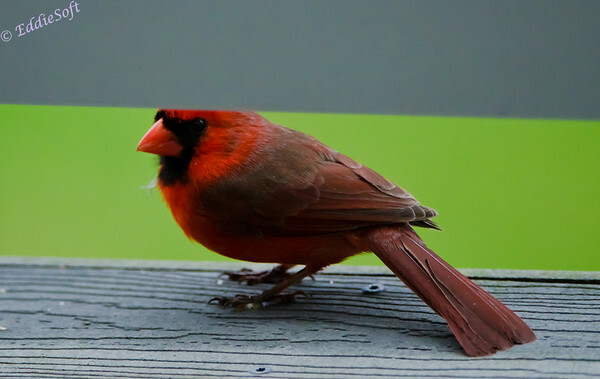 After about 20 minutes the cardinal started to regain composure and raised up on its feet. For the next 10 minutes he just sat there and looked at the surroundings (probably trying to rationalize what the hell just happened). Tragedy had been averted. Eventually it hopped around the porch a little and headed out under the railing to join his friends. I had grabbed the camera to take a final shot and headed to the porch door. While looking through the viewfinder, the little guy turned back and looked at me for a brief moment before he took flight. Maybe he was thanking me or possibly cursing me for putting in the evil windows. Either way, my karma just got a boost. I might have saved this one and a few more, but I am not sure I’ve made up for the one I stupidly shot with a BB gun as a small kid and the one I sucked up into my truck grill. The good news is I’ve never hit a goose with a golf ball or crushed a beautiful, likely one of a kind protected owl with a Jeep Wrangler window… two things someone else in my household cannot claim! Hey, maybe these birds hitting our windows are just looking for weak spots in our defense in order to extract their revenge on this person is revenge for their tragically killed brethren.